Heat oven to 350°F. Butter an 8-inch cast-iron skillet. In another small bowl combine the granola and pecans. In a large bowl, beat the eggs and all but 1 tablespoon sugar until pale and thick. Whisk in the ginger and vanilla, then the flour mixture. 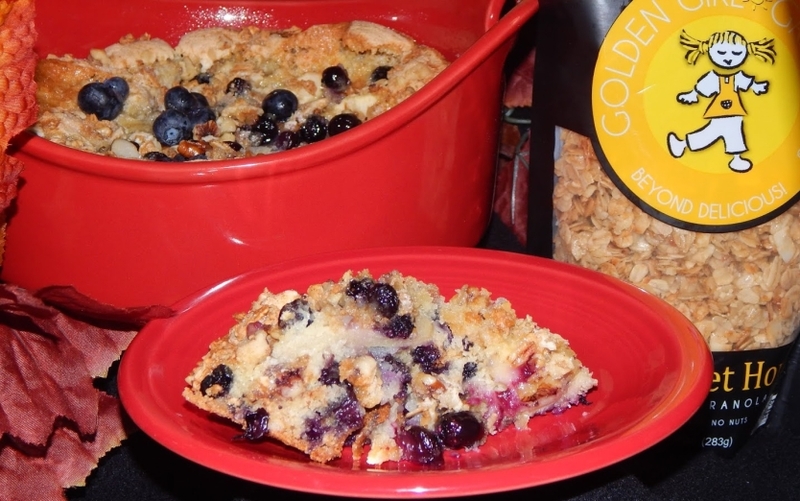 Chop half the apple and fold into the batter along with half the blueberries and half the granola-pecan mixture. Transfer to the prepared skillet. Thinly slice the remaining apple and arrange on top of the batter. Brush the apple with the melted butter and sprinkle with the remaining tsp sugar. Top with the remaining blueberries and granola-pecans. Bake until the top is golden brown, 40 to 45 minutes. Serve with whipped cream, if desired.